Assalamu alaikum brothers in Islam. May Allah (SWT) reward you with highest rank in Jannatul Firdaus for sharing this most blessed piece of information together with all those who read and share it. Hmmmm wonderful!!! may Allah bless islam, muhammad S A W and his companions. JAZAKALLAH KHAIR. A VALUABLE DOCUMENT IN THE HISTORY OF ISLAM. What a wonderful islamic history. May Almighty Allah reward you. ALHAMDULILAHI RABBIL ALAMEEN! ,no words to thank ALLAH SUBHANO WATA AALA for HIS favour on us ,that MASHA ALLAH we all are muslims.May ALLAH SUBHANO WATA AALA sends abundant blessings and peace on NABE KAREEM SALAL LAHO ALAIHE WASSALAM,all the messengers,belivers of their families,companion of Rasul Ullah Salal Laho Alaihe Wassalam and all the believers Aameen. Jazak Allahu Khairan!May ALLAH SUBHANO WATA AALA bless all of you with best reward in this world and much more hereafter Aameen.May ALLAH SUBHANO WATA AALA give each one of us successful life in this world and hereafter Aameen. 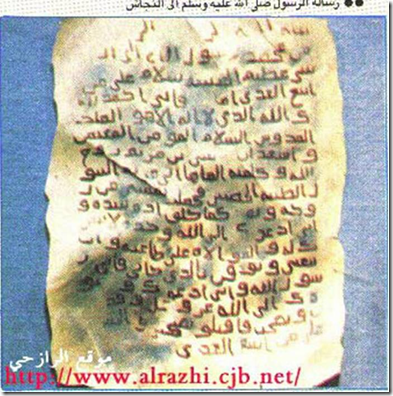 Very educative in history of Islam. May Allah rewards in abundant and accept it as part of ibahdat.